Iowa legalizes fireworks for consumers, finally! Posted in Uncategorized	| Comments Off on Iowa legalizes fireworks for consumers. In fact, in the entire Western Hemisphere. A group of highly trained professionals worked for almost two years, for the 10 seconds of amazing color, fire and light created in the mountain skies over Steamboat Springs CO on February 7th 2017. The shell had an amazing weight of over 1,100lbs and over 50lbs ob black powder was used to launch it into the atmosphere where it dazzled onlookers for miles and miles. Posted in Uncategorized	| Comments Off on Biggest Firework Ever Lit in the USA! Donald Trump cancels fireworks display. Actually, he canceled Hillary Clinton’s fireworks display. Donald Trump knew he was going to be the next President when Hillary Clinton 86’d her fireworks show. The Clinton Campaign had a grand display ready to to celebrate their coming victory, that quickly vaporized as votes were counted. Was Hillary over confident? Let’s all hope Trump is fireworks friendly! Posted in Uncategorized	| Comments Off on Will Trump be fireworks friendly? House bill 2852, or the fireworks bill has passed and changed the West Virginia firework laws making the sale of fireworks that are normally sold in Ohio and Kentucky now legal in West Virginia. 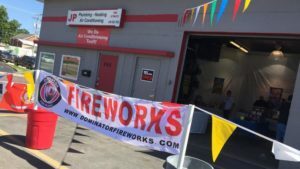 The state law legalizing the sale of additional fireworks takes effect Wednesday and revamps West Virginia Firework Laws, for the better for firework enthusiasts. The bill, which unanimously passed the Senate and House of Delegates, aims to raise money for veterans and volunteer fire departments, but Mike Shank said some fireworks should be controlled by professionals. 20,000 pounds of Illegal fireworks destroyed! Local police in Midland Texas assisted the ATF and other departments in destroying 20,000 lbs of illegal fireworks. No word as to the source of the fireworks or as to what type of fireworks they were. From the video they appear to be mainly 1.3g professional fireworks. In the NBC News link below at the end of the video you hear the reporters say “they should have saved them for the 4th of July” and “What a waste” We agree…how about you? July 4th, 2014 falls on a Friday! Why is this significant? Traditionally, sales “skyrocket” (pun intended!) when the 4th falls on a Friday, and after the near disastrous selling season of 2012 when much of the country suffered severe drought with many states banning the sales and/or use of fireworks this year so far appears to be all systems GREEN, as in profits. Sad news in the fireworks industry today. Entertainment fireworks in Washington State reportedly had an accident while some of their crews were prepping for an upcoming display, taking one life and injuring two others. Entertainment fireworks has been in the business for decades with an excellent safety record and some of the most experienced operators in the business today. In fact, they offered one of the more respected safety training classes in the western U.S. and have successfully fired many high profile displays. As respected, active members in all facets of the pyrotechnic industry our heart goes out to those involved and we hope this serves as a harsh reminder to the thousands who will be working long days in the coming weeks with pyrotechnics to take ALL safety precautions. Posted in Uncategorized	| Comments Off on Fireworks Explosion in Washington. Best Deals on Fireworks Online! Perfect for birthdays and safety at night for bikers, joggers and tons of other uses! Get them before they sell out offer ends 4/18/14. 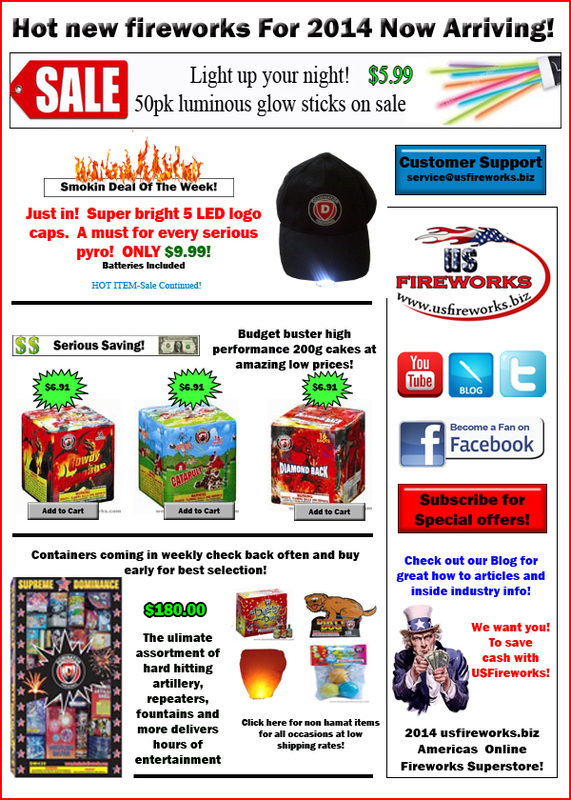 Posted in Uncategorized	| Comments Off on Best Deals on Fireworks Online!